As I approached an 18 wheeler on east bound I-30, I noticed his left rear inside tire was flat and wobbling. 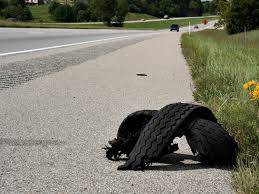 It had not started coming apart, and I thought if I could let him know he had a flat he would pull over and tend to it before littering the highway, making a dangerous situation for all. I pulled up alongside him getting his attention by staying even with the cab of the truck and signaling with my hand with a rearward down motion. I saw that he got my signals. I then pulled in front of him, maintaining my position for a distance. Then I gave a right turn signal and got off at the Friendship exit, hoping he would follow me. He did not. So I went through the exit and took off to catch up with him, this time dodging large chunks of truck tire scattered along the highway. I caught up with him again, went through the same procedure of going alongside him, and we both pulled over on the side of the interstate. I got out of my van and went back to him to find out that he was Russian and I could not understand a word he was saying. I showed him the tire which by now was only a couple of rings of rubber and steel around the wheel. The rest of the tire was scattered along the highway with cars having to dodge the chunks. I told him where the next truck stop was hoping he could understand me, and I went on my way. I know the man did not know me from Adam, but had he responded to check his truck out immediately, we would have prevented all the debris littering the highway. A lot of time we are naturally cautious to embrace spiritual things that don’t fit into our “norm.” Jesus said to test the spirit to see whether it is of God or not. The Spirit of God is according to love and truth, and the spirit of the enemy is the spirit of error and division (1 John 4:1-8). It is wise, when we get a signal that something is up, to check it out quickly so we will know what we are dealing with. Is what we see before us according to the truth of the Word and the way of love or is it man’s word and man’s way that does not totally harmonize with the pure, simple, word of God. If we pay attention to the signals, in due time, we can determine what is going on. The Spirit of God leads us to Jesus, the fullness of the Spirit of God, and following his leadership and guidance in all that we do, as did Jesus, for the good of all. If we follow that way, we won’t litter the highway with a lot of dangerous debris that can be harmful to fellow travelers on the road.